The HSBC Advance Mastercard currently has an Informr score of 8 out of 10. This score is based on our evaluation of 1 sources including reviews from users and the web's most trusted critics. HSBC Advance Mastercard is typically available to those with excellent credit scores (650 or greater). 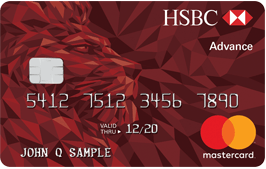 If you’re planning on travelings or shopping often, be sure to check out this HSBC Advance Mastercard Credit Card as it provides an array of benefits for its user. Or permanent $0 annual fee if you have a qualifying U.S. HSBC Advance or Premier checking account relationship.